ItemB-03747 - "Waterfront, Prince Rupert." ItemB-03750 - "Chief Dudoward's residence, Port Simpson"
ItemB-03751 - "Hospital, Port Simpson BC." ItemB-03794 - Cowgitz Coal Mine, Queen Charlotte Islands. 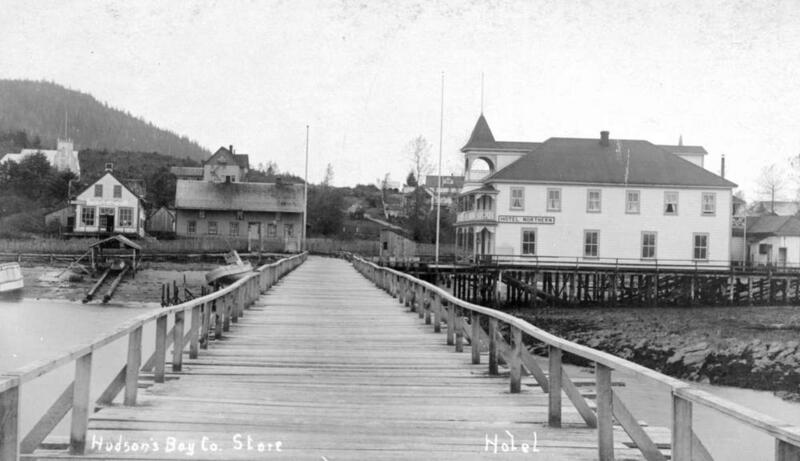 ItemB-03752 - "Hudson's Bay Co. Store; Hotel"; Hotel Northern, Port Simpson. ItemB-03759 - "Prince Rupert from Borden Street"
ItemB-03760 - "Dominion Day parade, Prince Rupert"
ItemB-03763 - "Port Simpson, BC; Girls' Home"; at far right of photo. Item B-03752 - "Hudson's Bay Co. Store; Hotel"; Hotel Northern, Port Simpson.